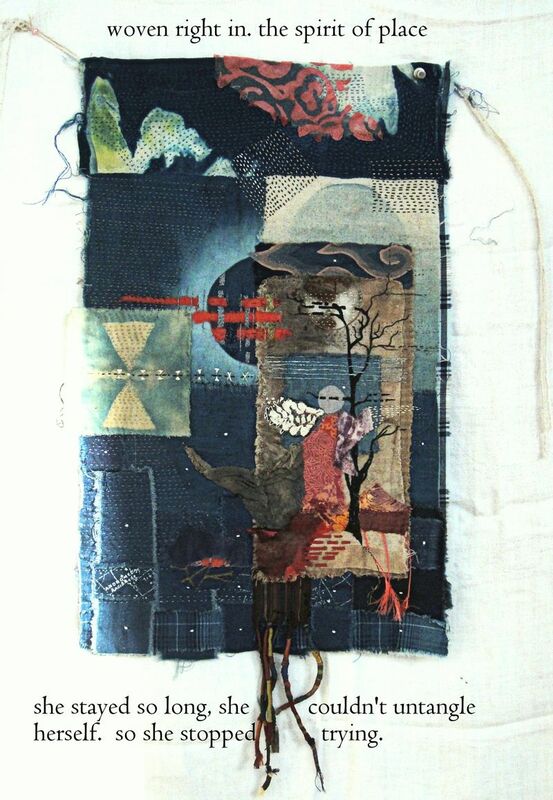 I have been enjoying reading Spirit Cloth, the blog of fiber artist Jude Hill for some time now. Last week she wrote a blog post that spoke to me. I did this small weaving , maybe , well, too many years ago to remember. And it was a little cloth made to be what I imagined home to be like… some place out in the middle of no where. Some where, where living a simple life and breathing clean air and growing food would just be the way it is. I gave it to Mom and Dad long ago, because they imagined that too. Although they never really got there. They made the place they lived in as close to it as possible. Built a life on a dream. That worked for them. I live in a nice place, but I know I will leave. Mostly about the cost of living but also other things too. I am thinking of doing a series of little tapestries depicting this place. Keepers of the sense of it. Before I go. I still have a lot of bits of hand dyed wool. Going grows closer. I figure, if I live long enough, maybe a few more of these with a sense of where I end up might be nice as well. Because weaving has a bit of home built into it for me. And weaving yourself into a place really says a lot about Home . Woven right in, Unraveling, Reweaving. Holding together in the most basic way. I hope that when I go, I will have sheep. Or find them nearby. That would work out real fine.